Xton Access Manager’s architecture allows scaling to offload components to other servers for performance, geographical or network reasons. One of these components is the Session Manager module. By deploying this component on a different server it can allow sessions to be established to computers or systems that may not otherwise be accessible. While this allows for greater flexibility, it is important that the connection between the XTAM web and these remote Session Manager components be secured to limit their exposure. This security comes in the form of a certificate that ensures the communication cannot be intercepted. If you are using a Windows Server 2008 or 2008r2 as the host for your remote session manager, please contact support for additional configuration requirements. Ensure that XTAM is Installed and configured on your master computer. Run the setup file on the remote computer where Session Manager is to be deployed. On the Welcome screen, click Next to begin the installation on this computer. Read and accept the License Agreement by clicking the I Agree button to continue. Uncheck all Component options except Session Manager. Click Next to continue. Choose your installation location and click Next to continue. When prompted, locate and select the certificate bundle that was deployed to your master computer where XTAM was installed earlier. Click Next to continue. You may select the zip file from this default location (if possible), copy it to a shared network location or simply copy the zip file to this remote computer and select it locally. The Session Manager service will now startup on this computer. Click Next to continue. Your remote connection to this Session Manager is now secured with XTAM’s certificate. Now that your remote Session Manager is available, you will need to create a Proximity Group to begin using its functionality in XTAM. Run the install script on the remote computer where Session Manager is to be deployed. Read and accept the License Agreement by pressing ‹ENTER› to display the agreement, ‹Q› when finished and finally ‹Y› to accept it and continue. Enter ‹N› to exclude each component except for the “Session Manager component” which you will include ‹Y› . 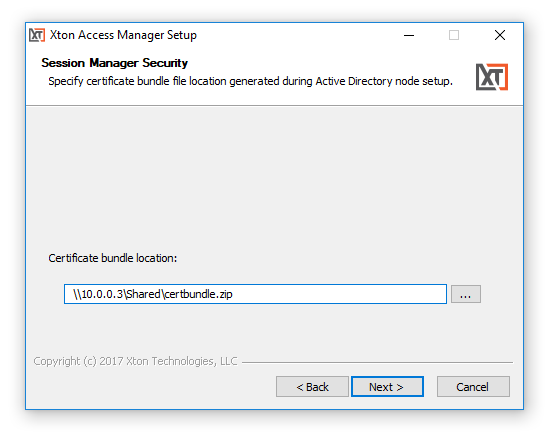 Next, enter the location of the certificate bundle that was deployed to your master computer where XTAM was installed earlier and press ‹ENTER› to continue. The Session Manager service will now startup on this computer and the installation script will finalize the operation. While the process to secure this connection is possible post installation, it is a little more hands-on. If you need to perform this operation, please contact us so we can walk you through the configuration.